After a hiatus of several years, Roslindale has a Thai restaurant again - Tasty Thai, which opened today at 153 Belgrade Ave., where 7 Star Street Bistro used to be. Read more. A cook from Thailand hopes to open Tasty Thai next month in the space formerly occupied by Seven Star Street Bistro at 153 Belgrade Ave. Read more. Drew Starr reports that Pad Thai, which closed a few months ago on Boylston Street, is re-opening on Hemenway Street, where Rice Bowl used to be. Patrice Taddonio reports she was at Thai Spice on Centre Street yesterday evening to pick up her takeout order when she realized she'd left her wallet 45 minutes away in Everett. Read more. A Boston health inspector reported today that S & I To Go, 168 Brighton Ave., passed an inspection after being shut last week for a variety of health issues. UPDATE, 10/5: Inspection passed, gets OK to re-open. A city health inspector yesterday shut S & I to Go, 168 Brighton Ave., for violations that included cockroaches in the restaurant's supply of sugar and evidence that rodents had gotten into its rice. Read more. A Cambridge Street Thai restaurant has changed its request for a later closing time from 3 a.m. to 1 a.m. 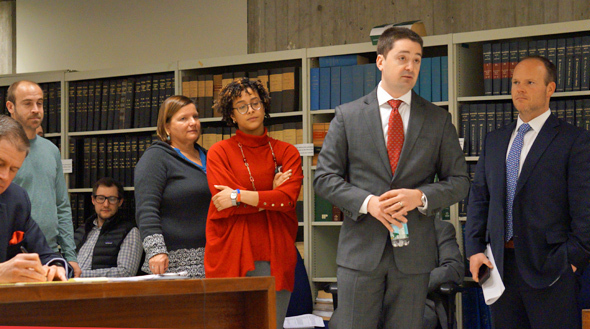 The Boston Licensing Board now considers whether to let [email protected] extend its serving times from the current 11 p.m. At a hearing today, a restaurant co-owner said he cut back the proposed closing time after meeting with the executive board of the Allston Civic Association, which said it could support 1 a.m.
You let McDonald's open early, next thing you know some Thai place is going to want to stay open until 3 a.m.
Oh, good God, Allston. On the heels of the Boston Licensing Board letting the Harvard Avenue McDonald's open at 5 a.m., [email protected] on Cambridge Street will seek permission to stay open until 3 a.m. This is exactly what Allston Civic Association President Paul Berkeley warned about, that his members are "fearful we're just going to become a 24-hour community." [email protected] goes before the licensing board on July 10, in the board's eighth-floor hearing room at City Hall. Soon to be ex-Thai restaurant. Sticky Rice Cafe opened this week on Centre Street, where The King/Samia's used to be, just a short walk from Phuket and up the Street from Thai Spice. Unlike those two, however, Sticky Rice Cafe also has Japanese and Korean dishes on the menu - with sushi on the way. Or maybe it was there all along and I just didn't know about it - until I happened to be sorting the mail the other day and noticed a menu. In any case, Hyde Parkians don't have to go all the way up to West Roxbury, JP or Norwood for Thai anymore - unless they want a large menu to choose from. The unassuming Asian Thai Eatery, 1084 River St., is really mainly a Chinese restaurant with a few Thai dishes thrown in - don't even think of stopping by if you want pad Thai or golden cups, for example. 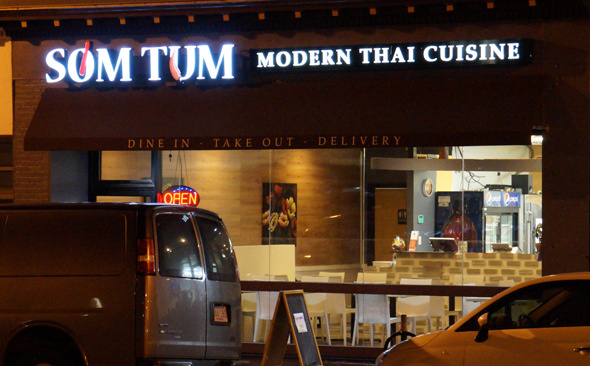 The Herald claims it may be an urban legend, but Harry Mattison wonders which Thai restaurant in Allston has a basement refrigerator stocked with new stem cells. They will also offer a weekend brunch menu, which is something the Square could use. Roslindale Ed. note: Brunch? Did somebody say brunch?!? I am so there. Gitell also has news of chef/menu changes at Bangkok Cafe. Who'da thunk it? Centre Street in West Roxbury now has two places to get Thai food - Thai Spice (really more of a take-out place than a sit-down restaurant) and Phuket, which recently opened where Cafe Le Royal used to be (1856 Centre St.). Nancy and I went to Phuket for lunch today. It shows promise, but could use a bit of work. How much longer for Thai food in Roslindale? The last few times I've been to Bangkok Cafe, there haven't been very many diners. Today, I went to order some chicken massaman curry for lunch. There was nobody in the dining room. When I went back 15 minutes or so later to pick it up, still no people. Unless they're doing a land-office catering business, that's not a real good sign. Oh, well. Some people say the quality's gone downhill since it opened (see the last review); the limited number of dishes I tend to order (basically, chicken massaman curry and more chicken massaman curry) still taste good.